Thank you all for your lovely comment on my SAL Jingles piece. I was stitching and stitching and stitching.. and then I found out I made a mistake.. but where???? Look at how far I got, but the snowmen, had no more room on the left. Mailed with Nia and Rita, and then I saw it..
On the charts there are around the piece empty squares, that you don't need to count, and I did.. So I frog, frogged,was frogging some more.. So and then, start again.. but where.. I really had no idea.. There is also a count mistake in teh Cheer chart's it's not 56 high, but 55. After founding that out I started again..
Then I also had another problem, Kira was coloring with markers next to me ( so much fun), and I wasn't paying attention, so I put my fabric on a marker, one big blue stain in my beautifull fabric.. But after washing it with special stuff, it was gone..
How is the weather around our globe??? I have a beautifull collage for you!! 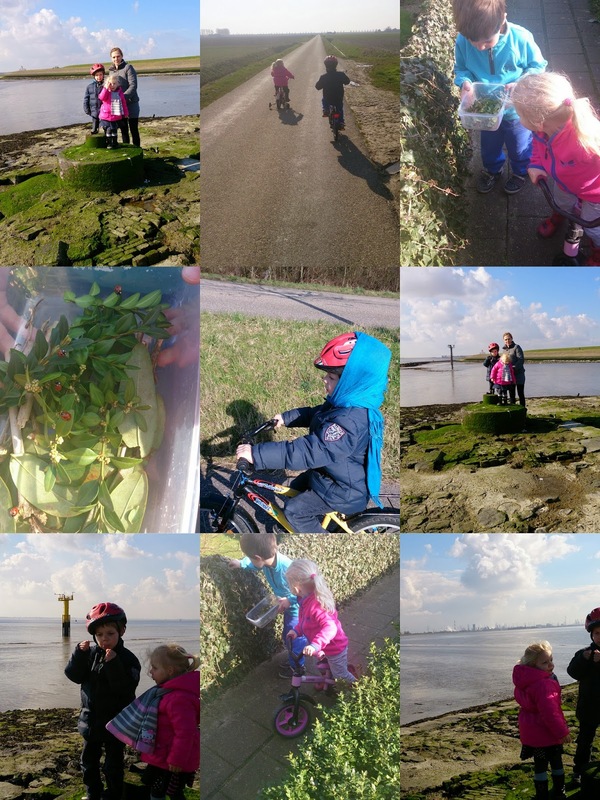 We went bike riding to the dike, walking in the polder, looking for ladybugs.. This afternoon, I wanted to try and be creative in the garden.. The big round one, I made first, then the little round one, and I also wanted to try a heart shape. Then I had some daffodils. So what will I do.. 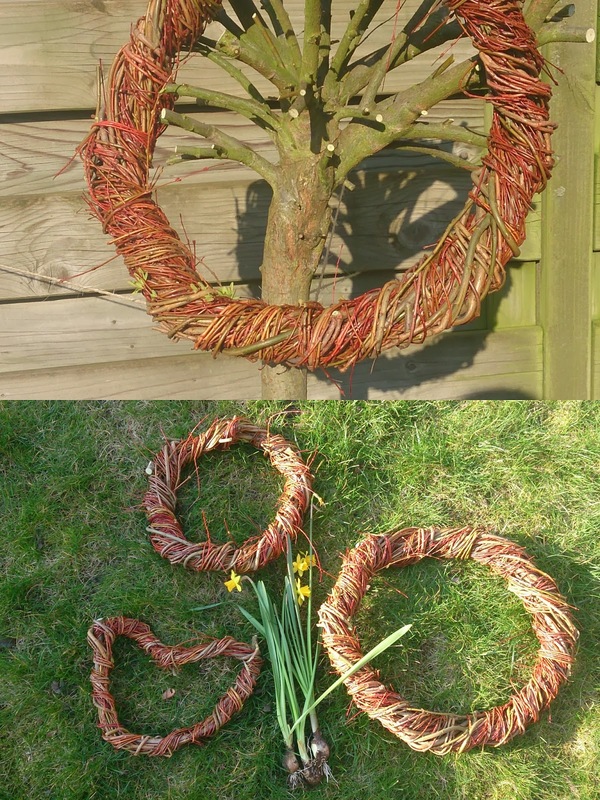 The left pic, the big round wreath hang next to my front-door.. I knotted with branches the daffodils on it, and put some robe to attacht it. Then right above, in my living some daffodils with a few little branches. 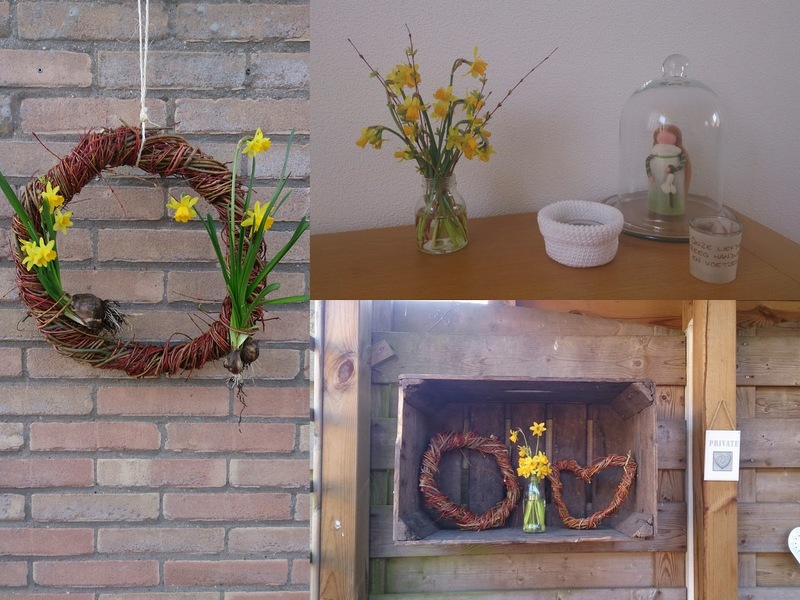 And below, I got a wooden apple crate a while back, I hang it and put the two other wreaths in there with the daffodils. Now I need to get some sleep, in a few hours I start my last night shift for this week..
3 more tree's to cut, maybe will make more!!! Or enjoy the weather.. we will see!!! Also have a date with my sewing machine.. but when???? mooi borduurwerk, balen van het terug uit borduren. Het is idd heerlijk weer. it's good you discovered now your mistake, later would have almost meant to restart from the beginning ! it's really beautiful, and a great thing you succeeded to remove the marker ! I'm not a real fan if summer, when it's too hot it's not my taste, but those last days have been very sunny and that's great, very good fir the mind ! I can understand the irritation of undoing stitches. It takes more time in frogging than stitching the same area. 1 steekje verkeerd en je gaat zo de mist in he. In spite of a few problems, your Jingles SAL is growing nicely. Glad you got that horrid mark out and that you caught your mistake before you had progressed too far! So i started the Cheer graphic and understood what you were talking about...and i think i would do the same mistake if you didn't say to me! So, thank you! I think that the chart should say something. Even because almost all the other ones has a limit around the charts, so its easier...but this didn't had, just on the free pattern. Oh well, at least some other girls can "learn" with this and not do the same mistake.